Central nervous system. 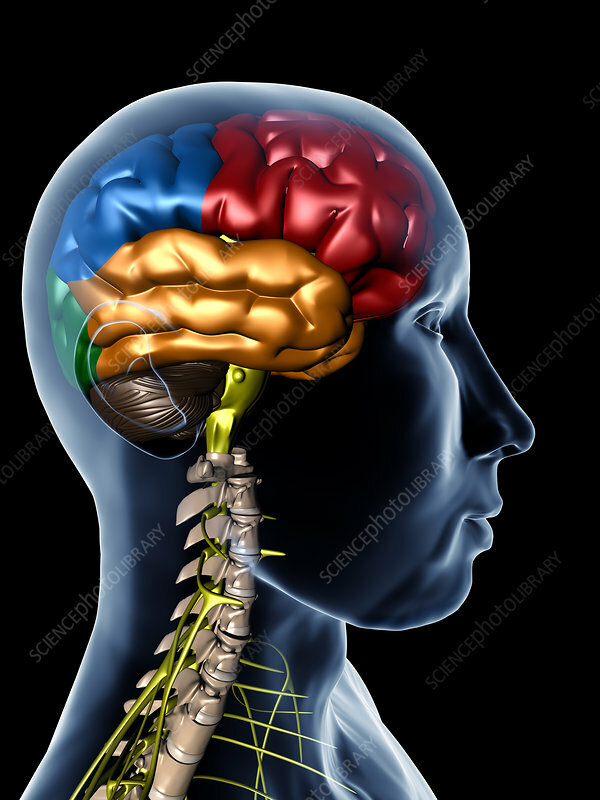 Computer artwork of a human head and neck showing the brain and spine. The cerebral cortex is divided into two hemispheres, which are further divided into four lobes; the frontal lobe (red), the parietal lobe (blue), the temporal lobe (orange) and the occipital lobe (green). The cortex is responsible for intelligent thought, language, memory and conscious movement. At bottom left is the cerebellum (brown). The brainstem (yellow) connects the brain to the spinal cord. The spinal cord runs down the centre of the spine (beige), which consists of bones called vertebrae. Through the spinal nerves it relays messages from the brain to the body and from the body to the brain.